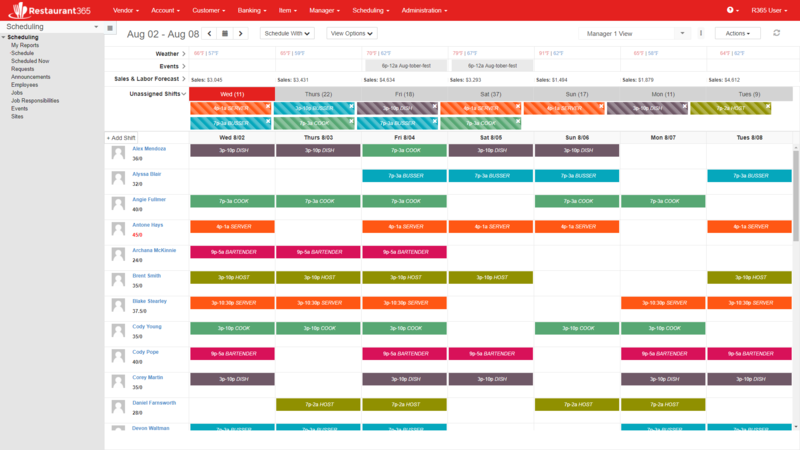 The Schedule screen in the Scheduling Module is a Calendar with Weekly or Daily views of the Schedule. From this screen Employee Shifts can be managed in a simple drag and drop form. To access this form navigate to the Scheduling Module, then select 'Schedule' in the left hand navigation pane. The Schedule Calendar will be shown in the center portion of the screen. The elements of this window are described below. 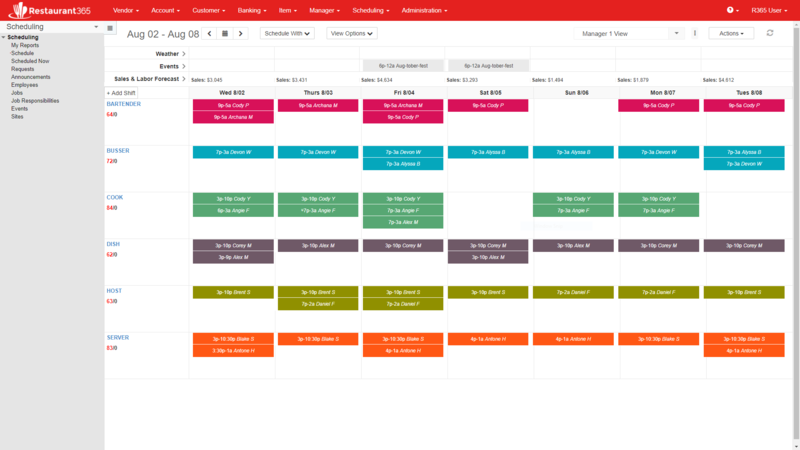 There are several selectors and buttons located in the Header that allow the User to select which Schedule to view and how the Schedule will be displayed. The User's Default Location will be set in the Location selector, all available Job Titles will be included, 'Week', 'Employee' and 'Unburdened' will all be selected, and 'Weather', 'Events' and 'Forecast' will all be enabled. These are the default View Option settings. Update each option as needed. The 'Actions' menu allows the User to perform bulk Actions on the contents of a 'Preferred View'. This means that Actions will only be performed for the Job Titles / Employees that were selected on the 'View Options' settings. Therefore, Schedules can be created and Published for only specific Job Titles / Employees and not the entire Location. Select the Employees who's Shifts will be Published (will default to all Shifts), then click 'Publish & Alert' to Publish and Alert the selected Employees per their Preferred Contact Method located on the Employee Record. Click 'Publish Only' to publish without alerting. This is the main section of the Schedule window where Shifts are placed on the Calendar. The Unassigned Shifts, or Shifts that have not yet been assigned to an Employee, will appear in the Unassigned Shifts section. The 'Unassigned Shifts' section is expanded by default, but can be collapsed as needed. Shifts exist in a 'Day Pot' on their respective Calendar Day. In the image above, 'Wed (11)' is highlighted in Red because the Day Pot for Wednesday of the current week is selected, and there are '11' Unassigned Shifts that need to be Assigned. Unassigned Shifts can be created by right clicking in the 'Unassigned Shifts' section and selecting 'New', or by creating a Shift and leaving the 'Employee' field blank. Any Unpublished Shift will have a small 'u' appended to the Shift in the Calendar view. This 'u' stands for 'Unpublished'. The 'u' is removed once the Shift has been Published. 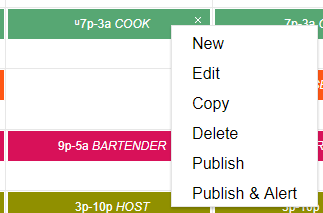 Right click on an Unpublished Shift and select 'Publish' or 'Publish & Alert' to Publish the Single Shift. To move a Shift to a different Date or different Employee, click the Shift with the left mouse button and hold down the button while dragging it to the desired slot and then release the button. If moved to a different day then the Date of the Shift will be changed automatically. If moved to a different Employee Row then the Employee on the Shift will be modified. This section behaves differently depending on if the 'View Option' is set to 'Job' or 'Employee'. The colors of the Shifts are based on the colors assigned on the Job form. The second is actual hours worked for this employee. If the Employee is scheduled for overtime, these numbers will turn red as seen in the image above for Antone Hays. Employee availability is managed on the Employee record. Click here for Employee training and refer to the section titled "Availability tab"
As of 10/31/2017, Scheduling V2 was released, and this article replaced the original Scheduling Calendar (which was published on 3/10/2016). Click here to download the original article in PDF form.